Did you know that working with your own Realtor costs you nothing if you're buying a new construction home? 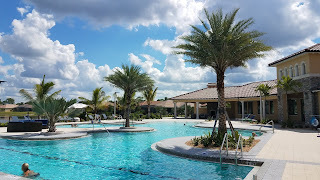 One of the advantages of working with your own Realtor when buying a new home in The West Villages is that I can compile information on all the new home communities, and put that information on my real estate website at davidbarrhomes.com. You don't have to click on all the different builder websites for the different communities, uncertain that you found them all. That's why I collected all the information about The West Villages CDD and HOA fees, and put it all on one page on my website: davidbarrhomes.com/west-villages-venice-fl-fees. Interested in other master planned communities nearby? I also serve Lakewood Ranch, and the 100% solar-powered Babcock Ranch in south Charlotte County, a little over an hour south of The West Villages. I have some more images for you from The West Villages that I took on September 30, 2018. Back in July I posted about the community pool at Renaissance. Here's an update The pool is complete and they were putting the finishing touches on the clubhouse. Construction at the Atlanta Braves spring training facility is also moving along. As your Venice FL and The West Villages new home sales specialist, please contact me when you're ready to buy. New homes cost the same when you're working with your own Realtor.